Light & Open w/ an abundance of windows & natural lighting! 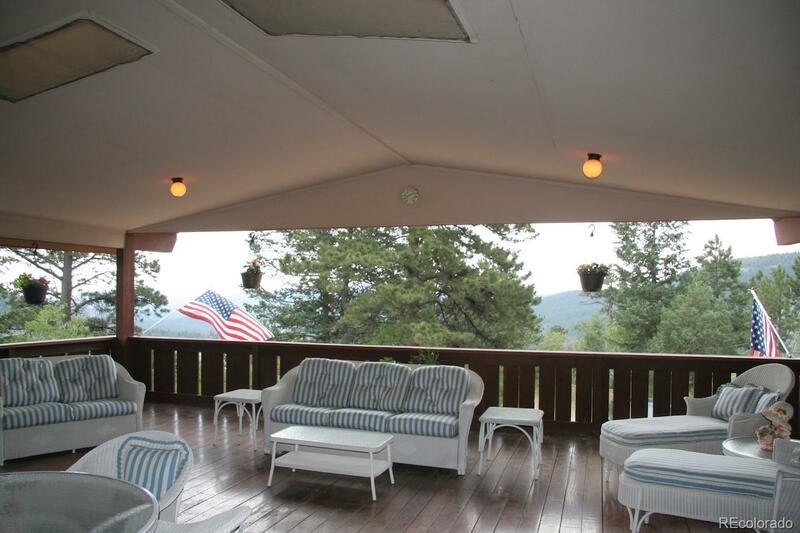 Spacious covered deck with gorgeous Colorado mountain views! Great location with easy access to I-70 (5 minutes) and Downtown Evergreen! Get to Lakewood in 20 minutes! Functional floor plan, w/ 3 bedrooms and a 4-piece full bath on the main floor! The living and dining rooms take advantage of the beautiful views that this location has to offer! Hardwood floors are in the dining and living rooms, and new luxury vinyl tile is in the kitchen and bath! The kitchen has a Subzero Rf, pantry, and good space! The walkout basement adds a large L-shaped family room w/ a fireplace and its own private patio for entertaining, a 3/4 bath, and a large study/den/guest bedroom/4th bedroom space! Attached to the main house is a private sunroom that is ideal for a home office, workout room, or meditation room! 3-car tandem garage w/ direct access from the house! 1.2 acres fully fenced! Great combination of function, views, & sunny location!